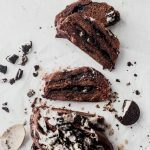 Cookies and Cream Babka is a magical combination of chocolate sweet bread, gooey chocolate filling, and, of course, Oreos. Be sure to top it all off with a glaze and an extra sprinkle of Oreos. Prepare the Chocolate Sweet Dough according to the directions. While it’s rising, prepare the filling by combining the cream, sugar, and salt in a small saucepan. Simmer over low heat until the sugar has completely dissolved, for 4-5 minutes. Remove the pan from the heat, then stir in the chocolate, butter, and vanilla until melted and smooth. Let it cool to room temperature. It can be made ahead and stored in the refrigerator. Preheat the oven to 350 degrees. Set out a baking sheet lined with parchment paper. After it has risen, roll it out on a floured surface into a rectangle that’s 12″x18″. Pour the filling over it, then spread it into an even layer. Sprinkle the chopped Oreos over the top, then roll the dough up along the longer side. Pinch the dough along the edge after it’s rolled up to seal the filling inside the dough. Using a sharp knife, cut the roll in half lengthwise. Lay the halves with the filled sides up, and pinch the ends together. Carefully lift the right half up and over the left, then repeat until you reach the other end and pinch them together. Set the loaf on the parchment lined baking sheet, then let it rise for about 30 minutes. Set it on a rack centered in the oven and bake for 45-50 minutes, or until the dough in the center looks competely baked. It should measure at least 180 degrees f on an internal thermometer. Once it is baked, remove it from the oven and allow it to cool. Whisk together the milk, powdered sugar, and vanilla extract. Use a spoon to drizzle it over the loaf, then sprinkle the Oreos over it. Allow it to dry before cutting.